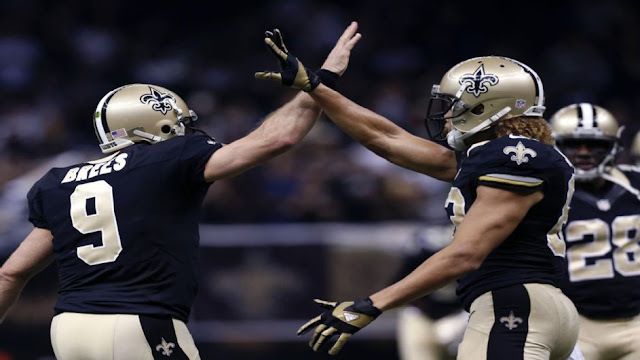 After a humiliating loss in Philadelphia in week five, the 2015 Saints appeared to be, and probably were, the worst team in the NFL at 1-4. Since then they’ve won three straight games against the Falcons, Colts, and Giants. Now midway through the season, it’s tough to tell if the Saints are poised to make a run or if they're just drunkenly shaking a Magic 8-ball every week. They’ve beaten the Brandon Weeden-led Cowboys; the Falcons at home on a short week; and a crumbling Colts team. Last week they beat the Giants in a freak show for the ages, a football game straight out of the mind of Salvador Dali. Now 4-4 at the halfway point, the 2015 Saints have been all over the map: frustrating (Tampa), hopeless (Philadelphia), surprising (Carolina), inspired (Atlanta), and explosive (New York). Their multiple personalities have kept us entertained along the way. Perhaps, after being left for dead just a few weeks ago, they might even be pretty good. If it looks like we’ve seen this story before, it’s because we watched the 2007 and 2012 Saints battle back to 4-4 after poor starts. What followed in those years was less than inspiring, and there may be a similarly sad third act on the way soon. For some reason though, this team's fate seems more hopeful. The Saints defense, as is its wont under Payton, has struggled mightily. They’re the league’s worst unit according to Football Outsiders. They’re allowing an average passer rating of 108.7, good (bad) for 30th in the league. They’ve given up a league-worst 6.4 yards per play. For context, the 2012 Saints defense, among the worst of all time, surrendered 6.46 yards per play—the worst mark in league history. It hasn’t helped that Brandon Browner is drawing penalty flags at an astonishing rate, or that Kennan Lewis is hobbled with an injury. A guy that Saints fans (like me) have hailed as the NFL’s next great cornerback in Delvin Breaux has allowed five touchdowns in the past two games. The 49 points surrendered against the Giants are a record high against a Sean Payton-coached team. The conventional perception that this Saints defense is a capable unit hasn’t matched its reality through eight weeks. Worse, it’s increasingly difficult to maintain confidence in a Rob Ryan-coached defense that’s been routinely outmatched for the last 24 games. It’s not all bad news, though. The Saints defense has been excellent on third down, fourth-best in the league. They’ve forced 12 turnovers, tied for sixth-best. 19 sacks are good for seventh in the league. Cam Jordan is playing at a Pro Bowl level. The defense’s youth—Kikaha, Anthony, Breaux, Swann, Richardson—offers some hope that the defense will improve in the season’s second half. Even better, they’ll be facing the league’s easiest schedule the rest of the way. Besides the schedule, the most confidence-inspiring factors for the remainder of 2015 reside in Sean Payton and Drew Brees. That’s obvious enough, but for a while this season, it looked like their individual bests were behind them. Brees injured his rebuilt throwing shoulder, faced an uncertain diagnosis, struggled for a bit, and then regained his form. Early in the season, Payton, a year removed from securing the “Grandpa Sean” moniker, drifted aimlessly under a fog of caution before finally shaking off the cobwebs. In the past three weeks, we’ve seen fake field goals, punt blocks, flea flickers, mindless challenges, and 4th down aggression—all things we’ve come to know and love from the unpredictable and brazen Payton. Lately, instead of quarreling with Rob Ryan on the sideline, Payton has smiled and fist-pumped and hi-fived and hugged his players. He’s got his damn Juicy Fruit back. This past Sunday, for just the third time under Payton, the Saints scored more than 50 points (51 vs. Green Bay in '08, 62 vs. Indianapolis in '11). Payton has a team and a locker room that he loves, and regardless of their expectations, the team is playing with joy and unity, a designed shift from the poison and acrimony of 2014, a current state that offers the best case for a strong finish this year. Most of all, Sean Payton has Drew Brees, a guy who, after all of these years, after all of the records, and after an endless parade of single-game heroics, just submitted the best regular season game of his career. There’s no point in even deconstructing its statistical brilliance or its context, a performance so singularly sublime it defies rote analysis. With Brees still capable of that, a peak that seemed past but is obviously not, it’s impossible to discount the Saints in any game for the rest of this season. As fun as it’s already been this year, maybe the real fun is just now getting started.